Interrogation (Persian Estentagh استنطاق) is a thought provoking, shocking, and occasionally tragicomic play based on the records of the interrogation session of Mirza (Mohammad) Reza Kermani, the man who shot and killed Nassereddin Shah, the fourth Qajar king, in 1896. The play was developed by Sara Mashayekh and Khodadad Rezakhani, and the concept has been perfected by all members of the cast. The play is in Persian, and the dialogues are based on the original record of the interrogation as has been recorded in various contemporary books, including Tarikh-e Bidari-ye Iranian (“the History of Iranian Awakening”) by Nazem ol-Islam Kermani. The first run of the play will be at the Central Stage in Richmond, California, on 10th and 11th May 2014. We hope to soon have more dates and venues added in order to bring the play to wider audiences. Nassereddin Shah became the fourth monarch of the Qajar Dynasty in 1857 and ruled Iran for nearly 50 years. The period of his reign is one of great upheavals and changes in the Iranian society, politics, culture, and economy. Faced with the aftermath of the Russo-Persian wars, he was forced to manage a country which was gradually becoming more and more impoverished due to a prolonged drought, the changing course of international commerce, and the rising power of European colonialism. Outdated and inefficient administrative decisions, internal court fighting, competing fractions, a social rift manifesting in religious unrest, and many other troubles made his period an example of Iran’s backwardness and gradual regression. A few days before the 50th anniversary of his rule, while visiting the shrine of Shah Abdulazim, a Shi’ite sanctuary to the south of Tehran, Nassereddin Shah was shot directly in the heart by Mirza Mohammad Reza Kermani. 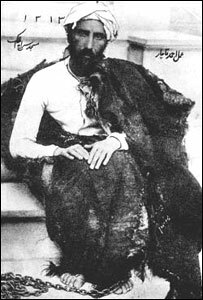 The assassin, a man of modest means who had suffered for long at the hands of the Qajar bureaucracy and had been imprisoned and tortured for many years, was also a devotee of Sayyed Jamal-ud-Din Afghani (Asadabadi) the famed Islamic internationalist thinker and reformer of the late 19th century. Afghani at the time lived in Istanbul, trying to convince the Ottoman Emperor to act as the rallying cry of the Muslim word against European colonialism and what was considered a diminishing of Islamic culture. Afghani had previously tried to get Nassereddin Shah to serve in the same capacity, but had been banished from Iran. Under the dual influence of Afghani and his own dislike of the Iranian administration, particularly Nassereddin Shah’s son and viceroy, Kamran Mirza, the embittered Kermani set out from Istanbul for Tehran, on the way purchasing a Russian five-shooter, and on 1 May 1896, shooting the Shah. Mirza Reza Kermani, after his capture. The record of Kermani’s interrogation, a combination of his actual confessions as well as later literary embellishments, is a fascinating window into the mind of the late 19th century Iranian reformists. A combination of modernist ideas, nascent nationalism, and retelling of pure cruelties he suffered, they hold a certain contemporary relevance that is shocking and fascinating for the modern audience. The play tried to convey exactly this shock and interest and bring up issues that still occupy many people’s attention.